My Bower I was created in the manner of the mating structures of the Satin Bowerbird, with no internal supports or glue etc. Bowerbirds are the only animals besides human beings known to attract and select mates based on subjective aesthetics. 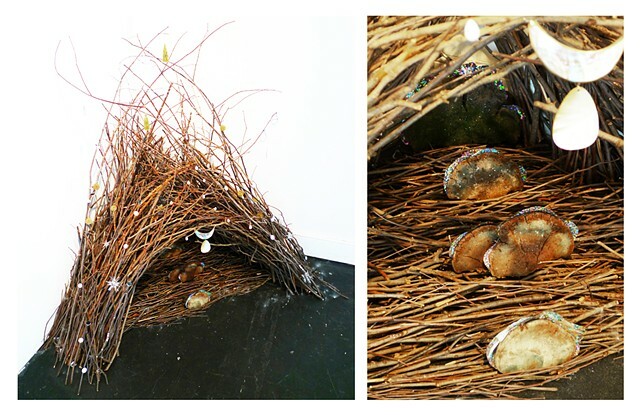 In the case of the Satin Bowerbird, the males build a structure from twigs and then decorate it with objects, both natural and man-made, that strike their aesthetic fancy. Females then choose their mates based on the beauty of their bowers. The bowers are not used for rearing chicks, but only as a sumptuous venue for the male's mating dance.